amoena (rubra) x amoena var. viridis ? First let us bemoan the problems of the horticulturist when trying to identify species. The taxonomist has it easy because he knows where the specimen was found in the wild. The horticulturist usually knows who he bought from and the trail stops there. The basic botanical unit is the species and the first description can vary from that taken of one plant or better still a selection of plants deemed to be closely allied and collected in the same area. In other words a selective decision is made. But it is still restrictive and if another plant is found later that almost agrees with the description this may or may not be given the same name. The key word here is ‘almost’ because this is very subjective. Some botanists only believe in species alone and do not split the species into even smaller boxes such as varieties. The problem with varieties is that you get inevitable overlapping so although you can work out the species you can have 2 or more varieties you can choose! 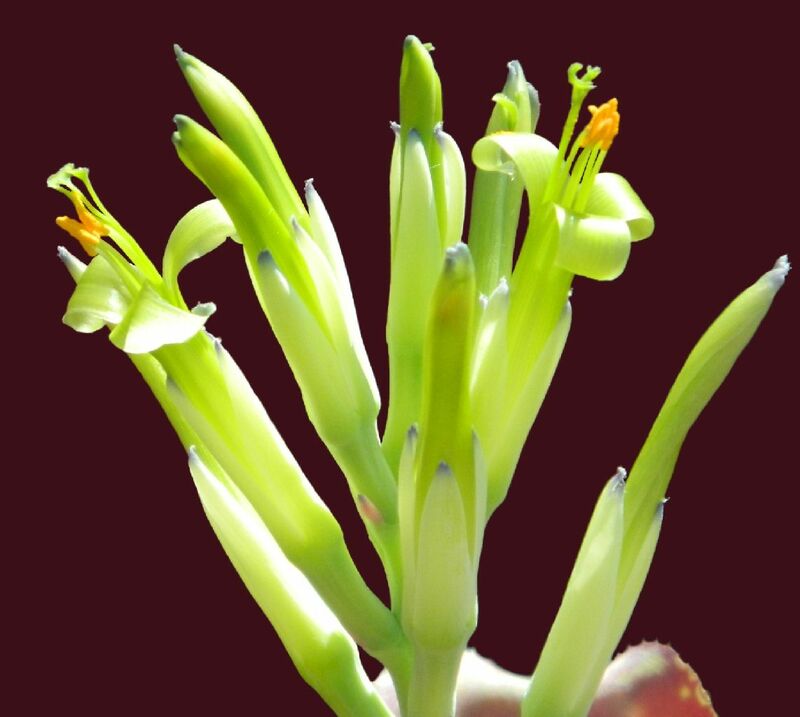 This brings us to Billbergia amoena with 9 varieties and the problems we have had in Australia starting in the 1960’s. Remember that at this time the only Monograph available was Mez 1935. I will show the key. Petala virentia non nisi summo apice minuta violaceo-maculata. - Folia (praesertim in vivo manifeste) dorso ad vaginae apicem impressa. - Folia dorso ad vaginae apicem haud impressa. - Folia angustiora elongatioraque, interiora apice haud emarginata vero mucrone herbaceo imposito rotundata; inflorescentia erecta. Over the years more varieties were added by Brazilian botanists and in 1994 Fontoura showed that there was no difference between var. rubra and the type so this became var amoena. Finally in 2012 I found it necessary to resurrect var. cylindracea which had been hiding as a possible synonym under B. sanderiana. Key to Varieties of Billbergia amoena as at 2012. That covers the situation from the botanists' point of view although there is a twist because while Foster who collected var viridis says that petals and sepals are wholly green, Smith’s description says that sepals are tipped blue! What has happened in Australia? I think we are growing the varieties amoena, carnea, stolonifera and viridis. There is a plant with red leaves and greenish spots and some silver bands with B. amoena var rubra on the label but has the flower of var. viridis not var. amoena. One such owner, Kent Jacobsson tells us that he got his plant from Peter A Franklin but with the comment on the label ‘Could be a hybrid!’ We know it is not PAF 799 nor PAF 1005 because of the petal colour! Now, Peter comes from Raymond Terrace which is near Newcastle which is Bill Morris’s stamping ground and alarm bells started ringing. You see, in the 1980’s the Butchers got a plant from Bill with B. amoena rubra x viridis on the label and we never got round to naming this intraspecific cross. In those days this was not technically a hybrid being intra-species. How different was it? Did it show attributes from both parents? All we know is that Bill got his plant of B. amoena var viridis from Kent’s nursery in California. From Bill’s memory this was a green plant with broad trichome banded leaves (not mentioned in the botanical description) and a flower that had total green petals and sepals. Offsets of this plant may still be in some Aussie collections. It is also reasonable to assume that the intraspecific cross (with probable white bands) that Bill Morris created is also around and could well be the plant to which we refer. Because of the uncertain identification of Kent Jacobsson’s plant I maintain we should follow Geoff Lawn’s suggestion and call it ‘Beaut Ruby’ and register it. 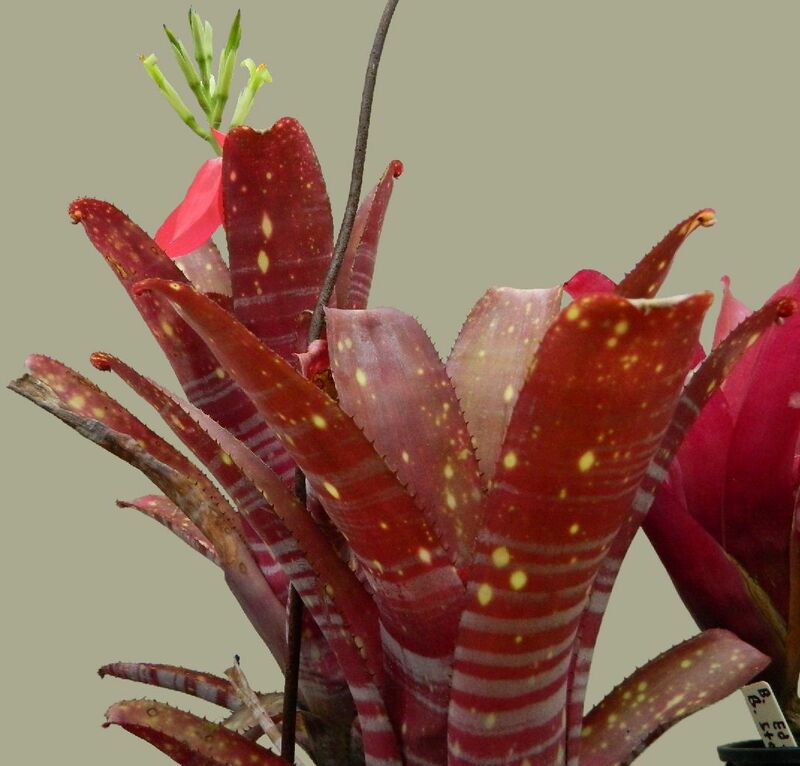 If there are other growers out there having a plant called Billbergia amoena var rubra and it looks like the plant featured here please change its name to ‘Beaut Ruby’!